* Received for review from publisher. By now you know of my love for historical fictions and my penchant for mysteries as well as the fact that on occasion, I wander outside of my comfort zone (YA). With that being said, I was a bit worried about jumping into the world of Maisie Dobbs as this is the eighth book in the series. I know, I know, usually it's a terrible place to begin reading a series but in this particular case, I was pleasantly surprised. The character relationships are well developed and as you dive into Maisie's world, you'll uncover character relations with relative ease. However, if you're looking for a mystery with a heavy helping of romance, this isn't it. Now that isn't to say that there aren't any romantic relationships in A Lesson in Secrets, but that they play a minor role in this particular installment of the series. Set in between WWI and WWII, A Lesson in Secrets will immerse you within the time period, just as Hitler's Nazi party begins its rise. 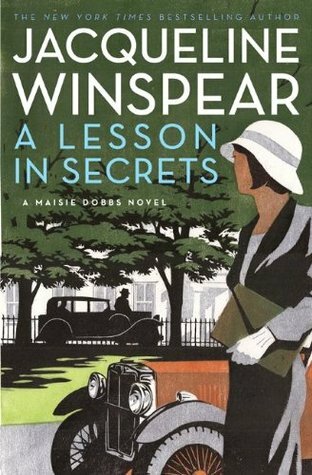 Maisie Dobbs has been sent to Cambridge undercover as a professor to keep her eyes open to spot possible enemies of the Crown or things that aren't in its best interest. Along the way she'll help a friend uncover her husband's murderer, unearth secrets of the seemingly peaceful college, and discover the man responsible for a death on campus (as well as his motive). It won't be an easy task, but that's precisely why Maisie has taken it on. A Lesson in Secrets isn't precisely a speedy read; you'll want to devote some time to it as it is detailed and personally I felt like it's the sort of book that you want to read at a leisurely pace. With that being said, if the summary has piqued your interest and you're a fan of historical fictions as well as mysteries, I'd suggest giving the Maisie Dobbs series a go--although perhaps you might prefer to start with the first book in the series (entitled Maisie Dobbs). Jump on in, the water's fine!